You know all that #NeverTrump talk? #NeverMind, says the intimidated governor. Cleveland—Until Donald Trump got into the 2016 Republican presidential race, Scott Walker was kind of a big deal. In June 2015, polls had Walker leading in the race for the Republican presidential nomination—and the governor of Wisconsin was leading the field in key primary and caucus states. But once Trump targeted Walker—in the first of his brutal takedowns of Republican rivals—the Wisconsinite’s presidential bid crashed and burned. Quite horribly. 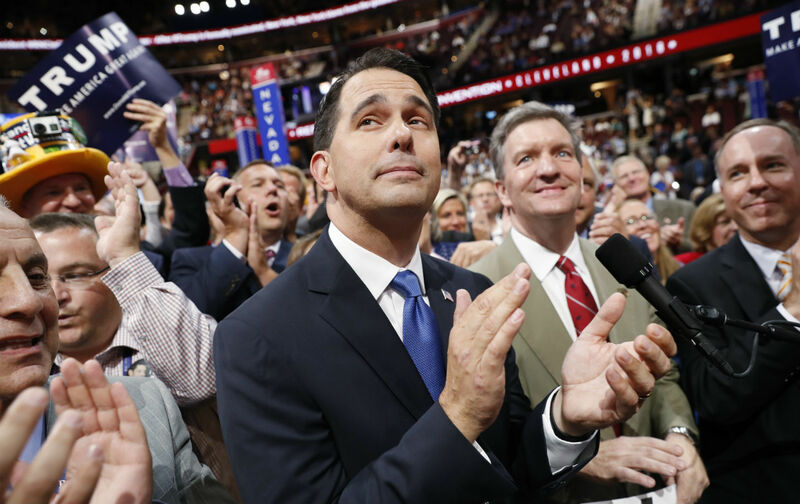 The horror was not complete until Wednesday night, however, when Walker appeared on the stage of the Republican National Convention that he had hoped would be nominating him this year. Instead of enjoying the accolades, he was embracing the candidacy of the man he once decried and denounced. Unlike Texas Senator Ted Cruz, the movement conservative who refused to compromise with the Trump campaign’s demands for partisan obedience (and, in so doing, created some actual political drama), Walker bowed to the new boss of the Grand Old Party. Politics requires humbling performances from its losers—especially those who, like Walker, harbor ambitions for contests yet to come. But rarely has a politician been more humbled than the governor of Wisconsin was when he swallowed his own words and spit out an endorsement of Republican presidential nominee Donald John Trump. It was the end of a painful journey for the Wisconsinite who had professed his presidential ambitions with a campaign book titled Unintimidated. Walker wanted Republicans to believe that he was a political tough guy—the Reaganite conservative who won a blue state and then busted its unions. But then Walker ran up against an actual political tough guy. The Wisconsinite did not go quietly. He campaigned for an agonizing few months as an ardent, if unsuccessful, Trump trasher. When Trump disparaged Arizona Senator John McCain—suggesting that the 2008 Republican presidential nominee was “not a war hero”—Walker ripped into the New Yorker. “I unequivocally denounce him,” the governor said of the billionaire. But Trump’s poll numbers kept going up, while Walker’s numbers kept declining. Walker tried to trump Trump with carefully crafted attack lines. The combination of a popular-culture reference and an unflattering comparison to President Obama—no favorite of the Republican crowd—drew a few gasps from the pundits. But it did not faze Trump, who shredded Walker and then went back to blasting Jeb Bush. Walker’s poll numbers kept declining. And less than a week after the Reagan Library debate, the governor quit the competition. He did so, he said, to stop Trump. Walker did his part, endorsing Texas Senator Ted Cruz in the Wisconsin primary and cheering on the last-ditch efforts of the so-called “#NeverTrump” movement in April and early May. But Trump rolled over the last of his 16 Republican opponents and this week claimed the nomination. Some of the vanquished candidates who had been Trump trashers—South Carolina Senator Lindsey Graham, former Florida governor Jeb Bush, Ohio Governor John Kasich—skipped Trump’s convention. Cruz appeared, but he made only a noncommittal reference to Trump. That angered Trump. But Cruz left with a shred of dignity. Not so for Walker. On Wednesday night, he was all-in for the guy who fired him from the 2016 presidential race. Walker did not stop there. While Cruz earned Trump’s wrath by suggesting that Republicans should “vote your conscience” in November, Walker decried talk among serious conservatives about backing a third-party contender such as Libertarian Gary Johnson. Translation: Remember all that #NeverTrump talk? Well, #NeverMind. And what did Scott Walker get in return for his surrender on the third night of his party’s convention? A thank-you tweet from the nominee, which was polite enough—except for the fact that it tagged the wrong Scott Walker (a television anchor in New Orleans). Even at a convention where Donald Trump has humbled an entire political party, it will never get any more humbling than that.